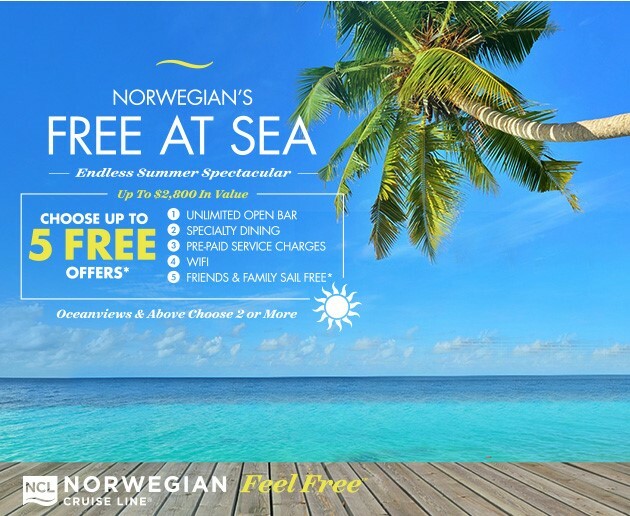 Norwegian's Free At Sea promotion is now an Endless Summer Spectacular! You can choose up to 5 fantastic, Free offers. When you book an Oceanview Stateroom or higher you get to choose 2 Free offers and better yet, if you book a Suite or The Haven, you'll get all 5 offers for Free! You can choose from: Free Unlimited Open Bar, Free Specialty Dining, Free Pre-Paid Service Charges, Free WiFi and Friends and Family Sail Free. Don't miss out on the deal of the Summer, book today, offer ends soon! Norwegian's Free At Sea promotion now features 5 fantastic, Free offers for you to choose from! When you book an Oceanview Stateroom or higher you get to choose 2 Free offers and better yet, if you book a Suite or The Haven, you'll get all 5 offers for Free! You can choose from: Free Unlimited Beverages, Free Specialty Dining, Free Shore Excursions, Free WiFi and Friends and Family Sail Free. There has never been a better time to sail with Norwegian but hurry, this offer was extended through July 2016! Starting Friday, April 15, 2016, and for the rest of this month, clients who book a new balcony or above stateroom on a 7+Day Departure sailing in 2016 will receive FREE Prepaid Gratuities! Norwegian's Free at Sea deal has been extended through April 24. Contact me today to book your cruise with 1 free perk for Inside or Oceanview staterooms and 2 free perks for balcony stateroom or higher. Book a Suite or The Haven and get all four. The drink package alone is worth over $500. Perks apply to up to 2 people per stateroom. Total value for all 4 up to $2,500.